Once December first chimes in, I desire nothing more than to immerse myself in all things Christmas. Christmas music, movies, treats and scents. Judging by the posts I see on Instagram, I'm not alone in this. It's the most wonderful time of the year after all. 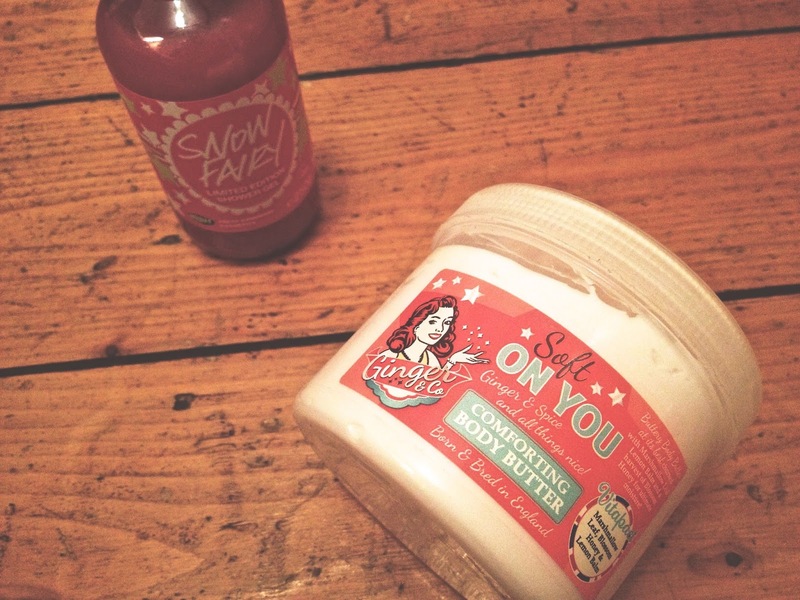 My two favourite products at the moment in the run up to Christmas are Lush's 'Snow Fairy' and the 'Soft on You' body butter from 'Ginger and Co'*. Shower time at the moment consists of a little unknown product. 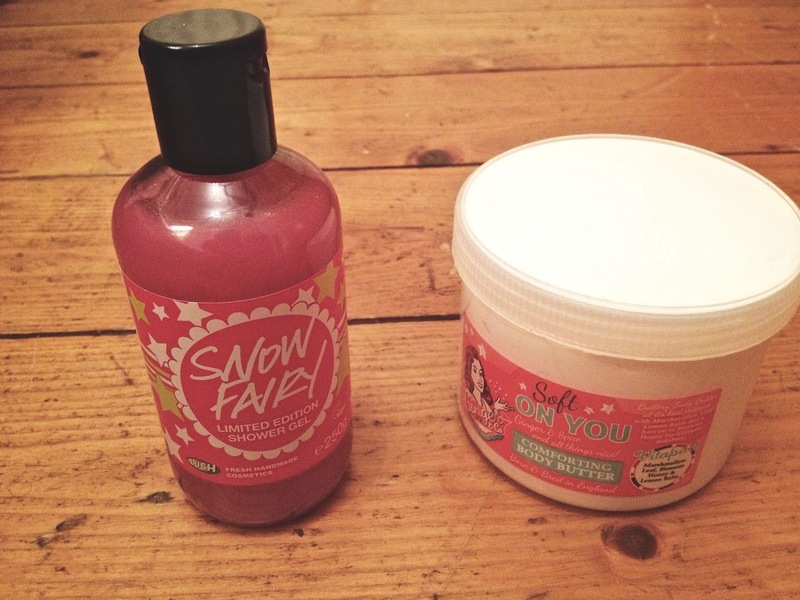 'Snow Fairy' from Lush is pretty unheard of in the blogging community. I rarely see bloggers discussing how amazing this smells. Jokes, jokes. It's pretty damn popular. So popular in fact, that it was hard for me to get my hands on the bigger sizes. Obviously everyone in Dublin has been stocking up. I love Snow Fairy, it's so sickeningly sweet and it's what i imagine the powerpuff girls mixture to smell like, sugar, spice and everything nice. I've been using it pretty sparingly and I need more of it in my life but it's hard when the Irish shipping costs for Lush are so cray cray. Maybe as a Christmas present from me, to me. Post shower, I have replaced my beloved Vaseline Spray and Go, with this body butter from 'Ginger and Co'. 'Ginger and Co' are a fairly new company, who in the last couple of months have launched in select Penneys stores across Ireland. They're a 1940s inspired bath and body brand with a number of products ranging from hand cream to bubble bath. Their packaging is reminiscent of 'Soap and Glory' but that's where the similarities begin and end.Where 'Soap and Glory' can be on the pricey side, 'Ginger and Co' keeps their costs all well below 10€. Super affordable and amazing as your getting the same quality as 'Soap and Glory'. 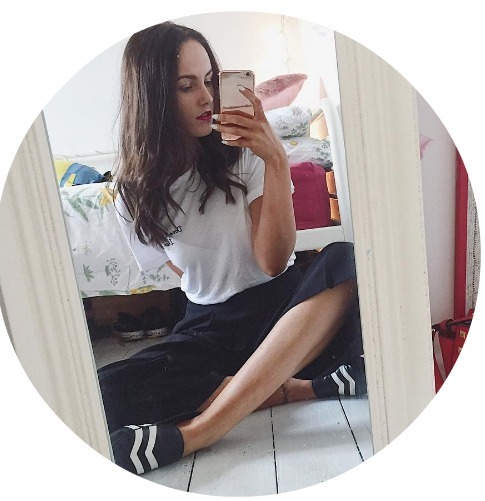 This 'Ginger and Co' body butter 'Soft on You' smells good enough to eat. You're essentially making your self smell like a giant ginger cookie. Nom nom nom. 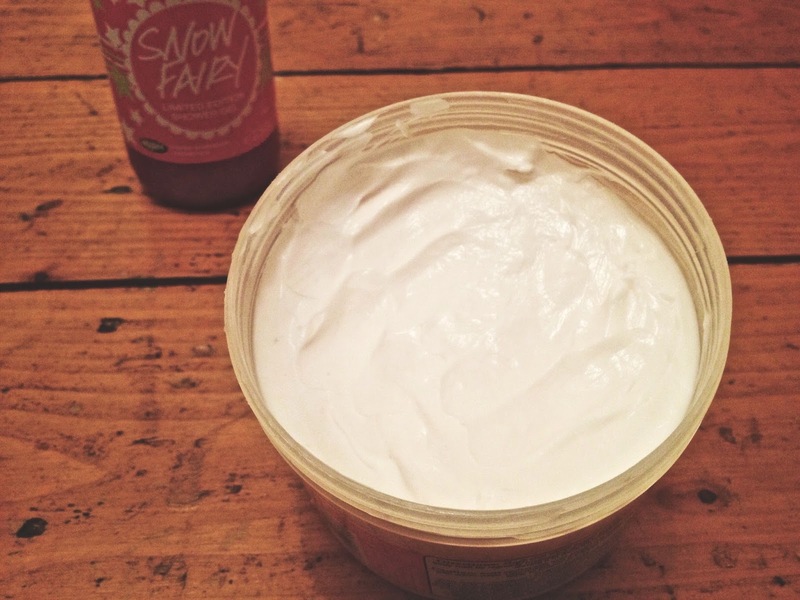 The perfect body butter for Christmas. This body butter feels different from other body butters, it feels less like a cream but more like a jelly. It's so cool, I've never come across a body butter with that kind of consistency and I'm obsessed with my body butters. I use this to moisturise all over and a little really goes a long way. Not that you would run out of this tub in a hurry because it's huge. The butter sinks into your skin pretty quickly which is perfect if you're in a hurry (popping out for last minute Christmas shopping, am I right?) and the ginger scent lingers on your skin for a good few hours after applying. I've had many compliments on it. So there you have it, the two products I use to make myself smell like Christmas in the er run up to Christmas.. Do you have any products you like to use in the run up to Christmas? Comment below. 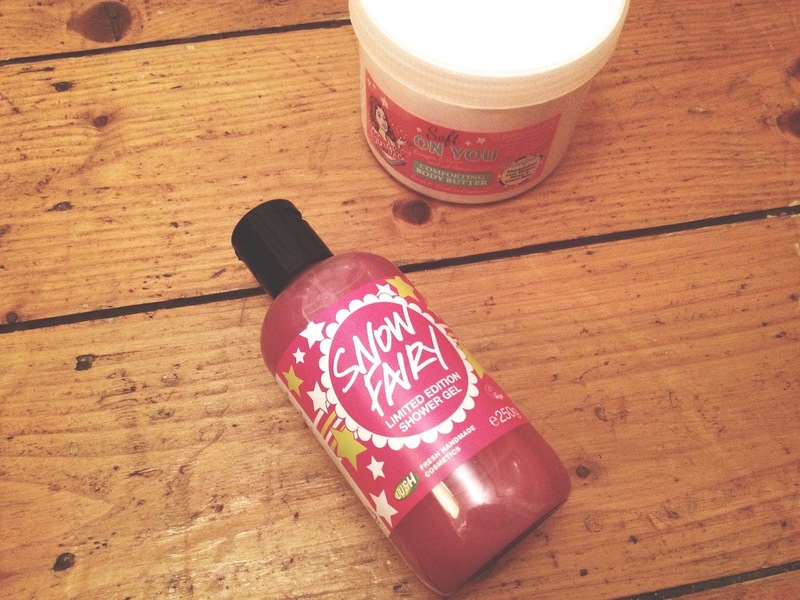 Soooo obsessed with snow fairy, so yummy!